Pearls, as well as small pearls, are only available as already-harvested samples in the original version of the game. 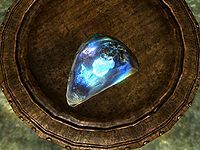 The only shellfish found in Skyrim are clams, and unlike in previous games they do not produce pearls. However, if Dragonborn is installed, pearls and small pearls can be harvested in Solstheim from pearl oysters. The only way to make this ingredient become available from apothecary merchants is to unlock the Merchant perk (requires level 50 Speech), at which point it is an "uncommon" ingredient. This page was last modified on 9 April 2018, at 05:58.